As infectious diseases go, tuberculosis (TB) is clearly one of the worst. Easily spread through the air by those with an active infection, it is a scourge that is decimating developing countries. The World Health Organization (WHO) estimates that, in 2014, 9.6 million people fell ill with the disease and 1.5 million died, with 95% of cases and deaths occurring in developing countries. Not everyone infected shows symptoms of the disease but for those with an active infection, one out of two patients will die without appropriate treatment. For HIV-infected patients, TB is almost always a death sentence unless treated. Tuberculosis is curable and preventable though it is particularly difficult to diagnose in children. Prevention relies on early detection and treatment and on screening programs. 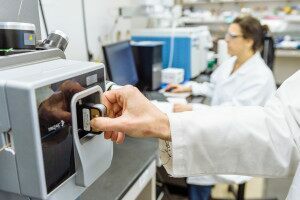 In projects funded by the Bill and Melinda Gates Foundation and NIAID, researchers at Colorado State University, in collaboration with teams at the University of Notre Dame and University of California San Francisco, are developing methods with liquid chromatography (LC) and mass spectrometry (MS) to identify pathogenic biomarkers that may one day prove useful in diagnosing and treating the disease. Lead investigators, Drs. Karen Dobos and Nicole Kruh-Garcia, together with the University’s Proteomics and Metabolomics Facility Director, Dr. Jessica Prenni and her team, have developed a sensitive and accurate LC-MS method to detect a panel of nine bacterial peptide biomarkers from host serum exosomes that are correlated with infection. The method could one day identify biomarkers from which subsequent assays can be developed that will identify those as having, or who are most at risk of developing, the full-blown disease and get them into treatment – a important step in curbing transmission and spread of the disease. 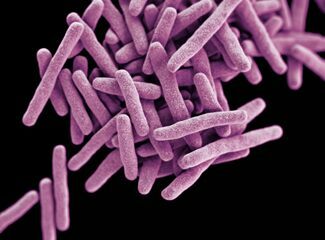 The current LC-MS method targets surrogate peptides derived from the Mycobacterium tuberculosis (Mtb) proteins under study. For this method, sensitivity is paramount – specifically because the target bacterial peptides need to be detected within the background of human serum. Robustness and throughput are also critical due to the complexity and large numbers of clinical research samples to be analyzed. The iKey being inserted to the ionKey/MS System at the CSU Proteomics and Metabolomics Facility. 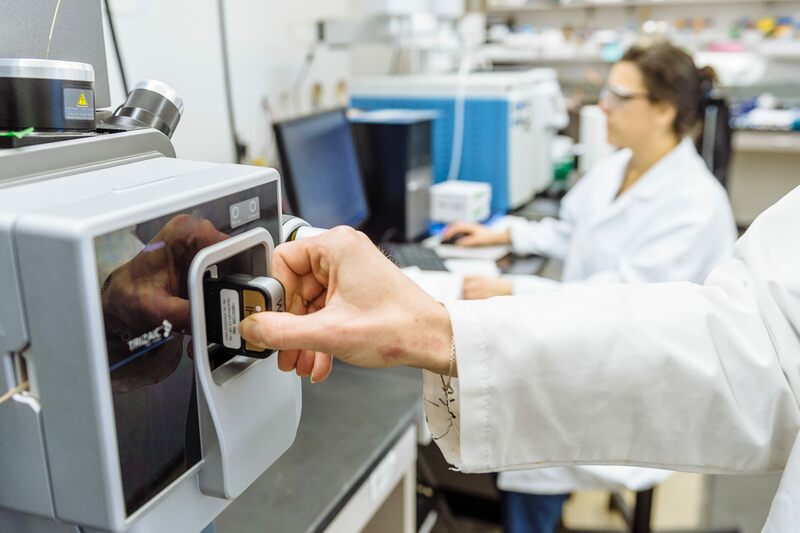 To achieve the required analytical sensitivity, robustness and throughput, Dr. Prenni’s team at CSU employs a novel microscale separations device – the ionKey/MS™ system from Waters, winner of an R&D 100 Award in 2015. The iKey™ separation device is a self-contained cartridge roughly the size of a smartphone that integrates with the ACQUITY UPLC® M-Class System and the Xevo® TQ-S mass spectrometer. The chromatographic separation of the sample peptides occurs on 1.7-micron particles packed inside a 150-micron (i.d.) channel etched into a ceramic, monolithic substrate. As the separated peptides elute from the iKey they are introduced into the electrospray source of the mass spectrometer. A separation at this scale and at a flow rate of microliters/minute efficiently produces a plume of very fine, charged droplets that the mass spectrometer captures. The sampling efficiency, ionization efficiency and chromatographic performance enabled by ionKey/MS are equal to, and for some peptides, better than those of traditional nanoelectrospray. Dr. Prenni’s team has performed thousands of separations on a single iKey without seeing a degradation in performance. The method developed by the team at CSU is now being tested with a cohort of 600 TB patients and controls. Ultimately, their goal is that one day the data generated from this research can be translated into a next-generation point-of-care test for TB that is accessible even in resource-poor environments. Science and rigorous health care screening programs have rid the world of smallpox and soon, perhaps, polio. Will TB be next on the list? This article first appeared in Pittcon Today, 3/10/2016.